It seems as though we just announced a bunch of new fabrics for Spotlight, doesn’t it? Well, here are some more! These are some of the prints I loved most when I was designing the collection, and I was afraid they wouldn’t get picked up because they’re large in scale and are quite bold. But Spotlight has been so supportive of these designs! And I’m just thrilled because these are the prints I’ve been wanting to sew for myself. The watercolor broken stripe is one of my favorites. It’s printed on our much-loved twill, which is so perfect for dresses, skirts, and jackets. I’m making a dress from it right now and have plans for a skirt. I can’t show you the dress yet because it’s an upcoming Liesl + Co. patterns that isn’t quite ready. Soon, I promise. We’ve also use that great twill quality for the rows of dots that come in two colorways. I think the navy is really pretty, but the bright pinks and oranges are so vibrant and fun, too. And that big abstract floral? Sateen! It’s so soft and drapey, and the large scale is perfect for women’s apparel. I think it really wants to be a dress or a tunic. But which colorway: the blue/green colorway or the pink/orange? Tough call. I’m more of a green/blue girl, personally, but everyone who has seen this print seems to gravitate to the orange/pink. I’m also rather partial to the windowpane in sateen, which is so cute for dresses and tops. There are several other prints in the collection, including a poplin floral which has a bit of a printed texture that makes it really attractive. And if you liked our popular sailboat print from the last couple of collections you might also like our new umbrella print and the cloud print with hot air balloons and airplanes zipping around in the sky. Oh, and the big dots! Nearly forgot those. I’ll be cutting into that fabric soon, too. Again, tough to choose between the pink colorway or the blue/green dots. It would make darling little girls’ dresses, but I can think of so many other uses, too. 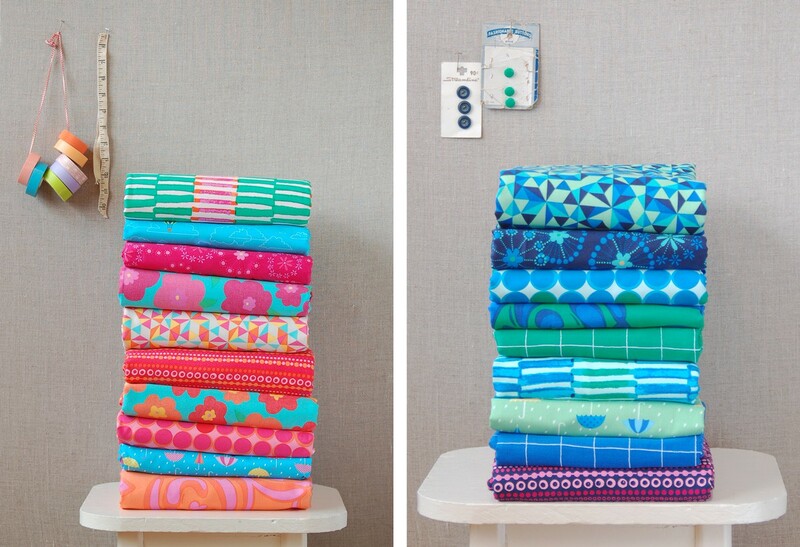 You can see all of the Fall 2014 Lisette fabrics for Spotlight in the fabric section of the website. Please, please, please tell me we’ll see these prints in the US! I need yards of that orange/pink floral sateen!